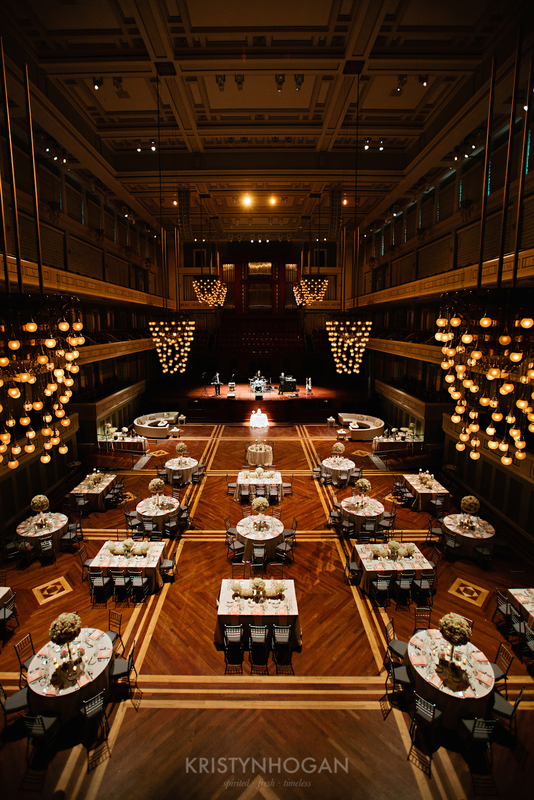 Last May 23 Jocelyn Sprouse took care of the wedding music for Ashley and Eddie at the Schermerhorn. The photographer has shared pictures with the vendors and I want to take this opportunity to brag on how wonderful the shots were. You can see more of her work at http://www.kristynhogan.com. September 26 found Silver Strings at the Opryland Hotel in the Delta Pavilion presiding over the music for the nuptials of Jennifer and Ryan. When Jennifer saw the Delta Room in the hotel a number of years ago, she knew she wanted to get married there. And it was finally so. The music covered all the bases from the sublime to the ridiculous. We played “Claire de Lune”, Mozart’s “Marriage of Figaro” overture and other classical selections for the prelude but switched to contemporary music for the processionals. “The Luckiest” was employed to bring in the entire wedding party. Jennifer chose “Dream a Little Dream of Me” for her entrance. One of the interesting things during the ceremony included a cross construction. The officiant described the symbolism of the construction of the cross while Jennifer and Ryan assembled the parts. Afterward two of Jennifer’s friends sang the hymn “Love at Home”. Now for the ridiculous….they recessed as husband and wife to Smashing Pumpkins’ “Tonight, Tonight”. After the ceremony we made our way to the Magnolia Ballroom lobby to continue playing rock and roll with a few standards thrown in. We knew we did the right thing when the bride nearly teared up as we played “Mrs. Darcy” from Pride and Prejudice. Krisie Washington of A Magical Affair did a great job of making the wedding run smoothly. We musicians are always grateful when the coordinator knows what she’s doing which makes it so much easier for us to do our job properly. Ok, this has to be the most fun we’ve had playing a wedding in many moons. The theme was Great Gatsby complete with flapper dresses, feathered headbands and long strands of beads for the women, white shirts, suspenders and fedoras for the men. The women musicians all got into the spirit of the period with their own headband creations. 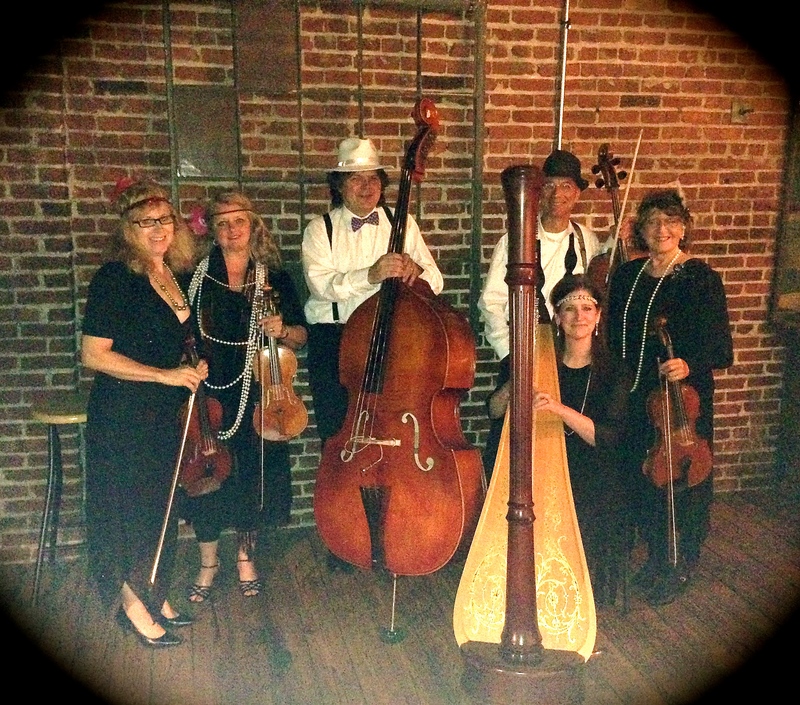 The quintet (the bass being the extra instrument) with harpist, Phyllis Sparks played 20’s and 30’s music for prelude as well as the processionals. So Lauren married Dustyn at The Experience Church in Murfreesboro on Friday, September 25. 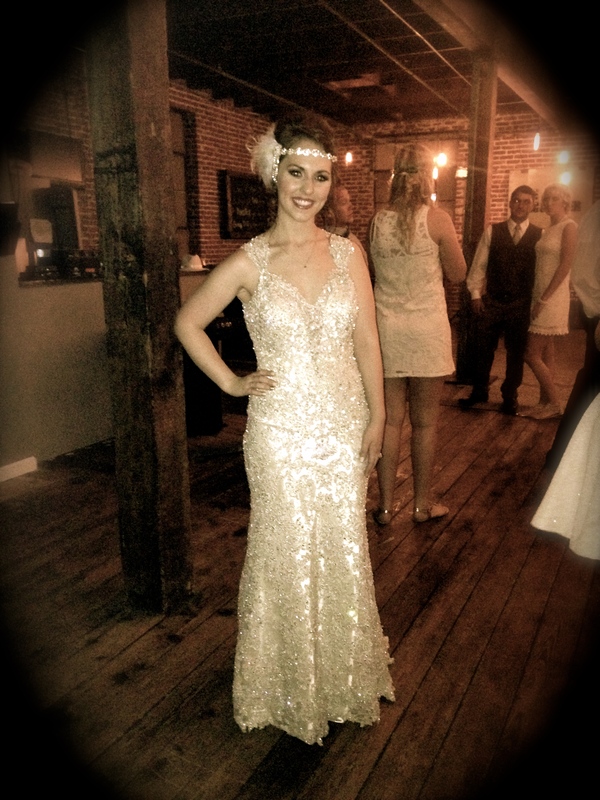 Lauren’s bridesmaids wore black and silver flapper dresses while her own gown was a beaded sheath reminiscent of the 20’s fashions. The music included songs such as “Take the A Train” and “Stairway to the Stars” for prelude. The processionals included “I Found the Girl of My Dreams” for the mothers, “Prelude to a Kiss” for the bridesmaids and “Sophisticated Lady” for Lauren’s entrance on her father’s arm. The newly married couple made their way back down the aisle to “Dinah”. The quartet was thrilled to have the addition of a bass which is so important in driving the feel of the vintage music. The harp was the icing on the cake. Phyllis put wonderful embellishments in all the right places. 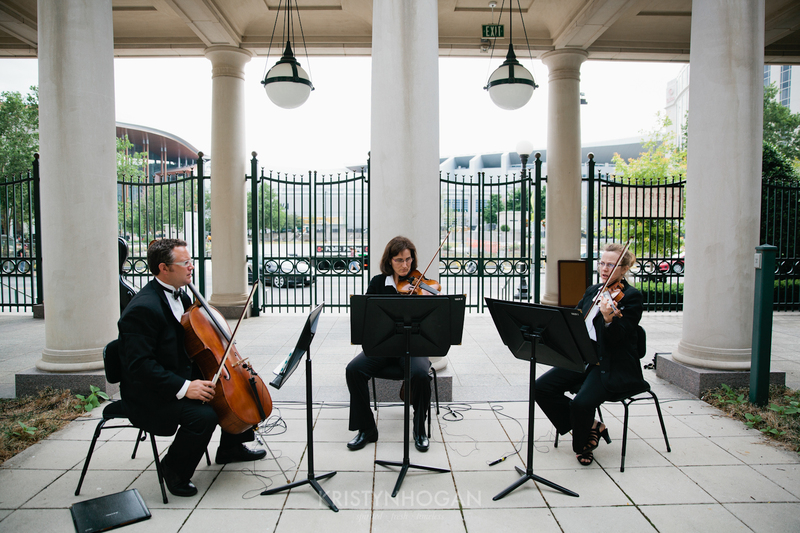 It was a real treat to be a part of a wedding where music really was an important part of the whole effect. Lauren and Dustyn are a lovely couple and such a pleasure to work with. Congratulations to them and many wishes for a long and happy life together. While I was busy elsewhere on 9/12/15 seeing that another couple was suitably married across town, Susan Mullen was taking care of business for me at the gorgeous East Ivy Mansion at S. 5th Street and Fatherland, the scene of the marriage of Deidre to Patrick. I did attend the rehearsal and decided that any officiant named Vito had to be ok.
Deidre and Patrick chose music from the Beatles for their processionals. This came as no surprise as Patrick is a rock musician. The trio played Beatles along with other soft rock tunes for prelude and then began seating parents to “Let It Be”, after which the bridesmaids entered to “All My Loving” which I had arranged especially for them. Deidre entered to a particular part of “Here Comes the Sun”, saving the chorus of the same song for their recessional after all was said and done. The trio continued with more Beatles and classic rock for the cocktail hour. 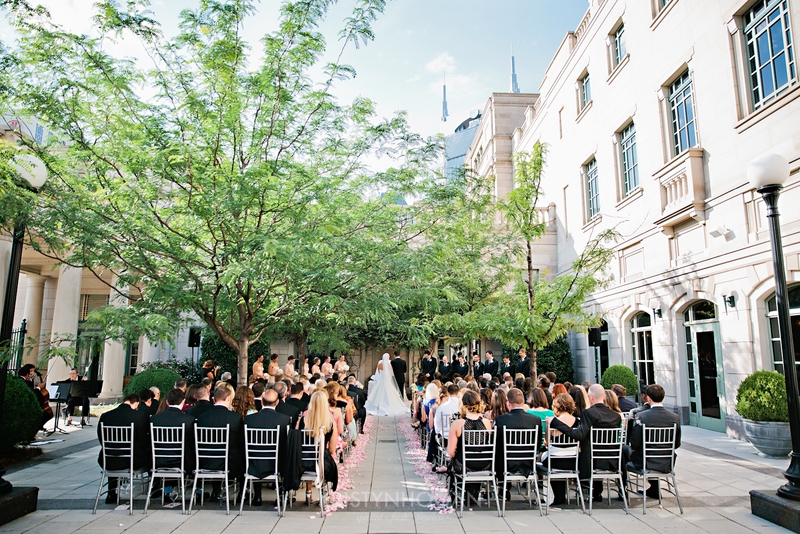 The coordinator for East Ivy, Jamie Lane, does a perfect job of making a wedding run smoothly. Congratulations to Deidre, Patrick and their families and many wishes for a long and happy life together. On September 12 Silver Strings was in attendance at the nuptials of Emily and Jake which took place in Wightman Chapel on the Scarritt Campus. This chapel has to be our all time favorite for the wonderful acoustics. Emily chose traditional classics for the prelude as well as the processionals saving the fun stuff for the cocktail hour that took place at the Hermitage Hotel downtown. The processionals included the Bach “Air” from the Suite in D and “Jesu, Joy of Man’s Desiring” for the mothers and bridesmaids. Emily chose the always beautiful and appropriate “Canon in D” for her entrance. Staying in the classic tradition they recessed to “Wedding March”. Kelly Dillinger of Kelly Dillinger Events was our able coordinator for the day, giving us perfect signals that helped us time the music to a T.
After the ceremony everyone made their way to the Hermitage Hotel to continue the festivities. We entertained the guests with a variety of Beatles songs, standards, love songs and good old rock and roll. Best wishes from Silver Strings to the newlyweds for a long and happy life together! Once again I’m reminded of the old saying “the hurrier I go the behinder I get”. That’s my excuse this time for not blogging for nearly a month. But it’s not about me this time. It’s about Beth marrying her sweetheart, Taylor, in the lovely Will’s Garden at Cheekwood on September 5. I didn’t get the memo about the ceremony starting 30 minutes later than the contract so Susan Mullen, Gary Tussing and I arrived early and just decided to serenade the soon to be married couple while they had pictures made so they actually got to hear the prelude music including the request, Aerosmith’s “Sweet Emotion” I had arranged for them. Beth chose a mix of traditional and contemporary music including “Jesu, Joy of Man’s Desiring” and “Canon in D” for the mothers and bridesmaids but went 20th century with Coldplay’s “Paradise” for her entrance. After a very short ceremony we shooed everyone to the reception area to Muse’s “Starlight”. The reason the ceremony was foreshortened was the rain threatening a downpour. Drops started falling as we played the bridal processional and then went dashing for our cases to keep our instruments out of the rain as soon as Beth and Taylor were in place. We threw our folders into their case keeping the recessional out in case the rain decided to hold off for another five minutes, which it did. That was a close one. After the ceremony was over and the guests were on their way to the Frist Learning Center for the reception, we dashed over there ourselves to play for the cocktail hour. The final request by the bride and groom was for us to play “Another One Bites the Dust” as they were introduced as husband and wife to the guests just before dinner. Congratulations to Beth, Taylor and their families and warm wishes for a long and happy life together!